B&M Fabrications NEW 2017 REV GEN4 Rear Bumper. This work of art is much stronger than stock which strengthens the tunnel and has a firmer grab bar. These are CNC cut from .125" aluminum sheet and bent to follow the upper curved contour of the tunnel while leaving a 90 deg. bend on the bottom for strength. We are stocking matte black and 154 or 165 lengths. Minor trimming of the taillight may be required. 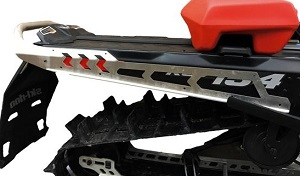 We installed one on our test sled and its a really nice, well made piece for a great price.